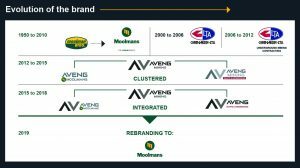 The separate operating groups, Moolmans and Aveng Shafts & Underground, were clustered as Aveng Mining during 2015 to optimise synergies between their operations and client base, coupled with an intent to standardise disciplines and best practices across both businesses. Following a significant restructuring within Aveng Group, the mining business used the opportunity to rebrand, as part of our Vision 2025 strategy and as the next step in our journey to becoming a leader in contract mining. By incorporating both operating divisions under the Moolmans brand, the business will capitalise on the goodwill generated by the Moolmans brand over more than 60 years of contracting. The integration of our open cut and underground mining divisions under one reputable brand also enables Moolmans to offer our clients a comprehensive set of specialised services across the mining value chain, leveraging our combined strengths, scale and mining contracting capabilities more effectively.